Have you driven a 1988 Ford Sierra? Displaying all 6 1988 Ford Sierra reviews. Lots Of Cash Skys The Limit — 80's icon! beast to drive when modded! big investment will not ever come down in price do to limited numbers of only 500 were made! won just about evert thing in it class in the 80's high pedigre car! one day will be worth its wait in gold! Looking for a Used Sierra in your area? Performance is stunning. It delivers well over 205 horsepower to the rear wheels only. The turbo kicks in with a gigantic push in the back, leaving everyone behind in a cloud of tire smoke as the Michelin Pilot Exaltos squeal for grip on the tarmac. The Borg/Warner Tremec T5 is a precise gearbox, but it wants to be handled with notice. It will deliver faultless, precise and quick shifts. The Cossie is known for being expensive to maintain. 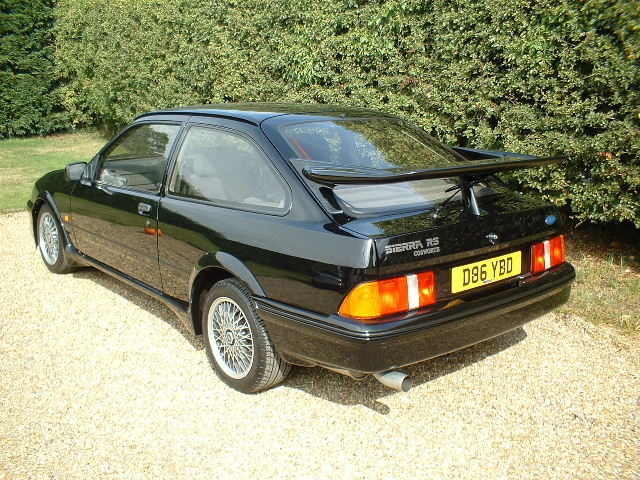 The Cosworth specific parts are expensive, but there are many dedicated sellers. The only expenses I had, were for new parts after I broke off some parts in an over- enthousiastic effort to tighten the fan belt. Ow, whell, bugger, them parts are expensive.... The appearance of my Cozzeh is completely lacking. 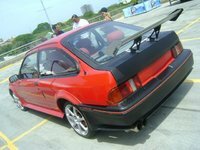 Only people who know them, will tell you it's a Cosworth. Otherwise, it looks like a normal family saloon car. The fun factor is only in driving it. It delivers an enormous punch, and it bites the tarmac like there's no tomorrow. It is hard to describe, but there aren't many cars today that handle this well. The suspension is rock solid and gives you the feeling that it can handle any situation that you'll get her in. But beware if you push it too far, then you'll never recuperate. Xr 4x4 Ex Police — I bought this car a few years ago as an ex Manchester Police car. It was one of the most enjoyable cars that I have owned. It was a 2.8i Xr4x4 but being an ex Police car it had been breathed on a fair bit. It was very quick from a-b and so easy to drive sideways!!! Ford Sierra 1.8 3-door — This car definitely offers most value for money. You won't get much luxury, but a reliable buddy who never lets you down. Lots of space, great gas mileage and comfortable seats. Loved It At The Time, Handled Well — Comfortable, useful hatchback easily as good as my Mondeo today.